Hi stamper friends, Martha Lucia from Stampartpapel here with another card to share with you. During this month you have been seeing this stamp in different styles. It's name is Two Cats in a Tree and as soon as I saw I felt that I absolutely needed it. To create my card I thought of blue or Pacific Point and Basic Black. Pacific Point for the base and black for the image, but I needed something neutral to balance the color so I decided to stamp the image of my Two Cats in a Tree with Versamark and Black Embossing Powder over Whisper White card stock. 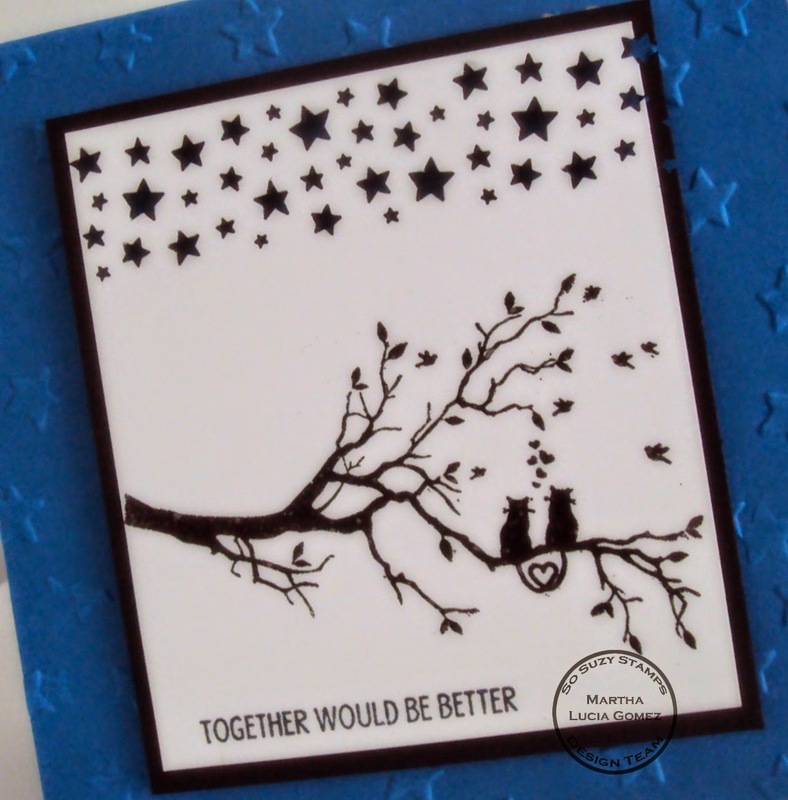 On the upper part of my card I created a sky with a Confetti Stars Border Punch. I punched the border in the same place over a piece of basic black card stock so you can the blue of the base through the stars. 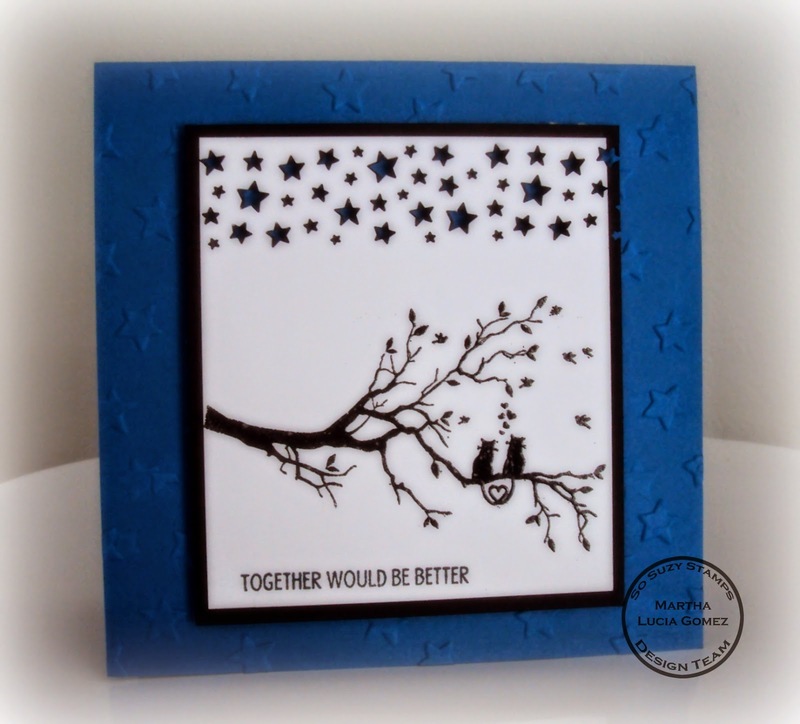 Over the card base I embossed little stars using a Lucky Stars Textured Impressions Embossing Folder. I stocked all the layers with dimensional to give more impact to the card. I can't have animals at home because I have a terrible allergies, so I am very happy with this stamp because now I have my own cats to play with and share with you. Now is your time to play with me and my friends here in our Currente Challenge and share your creations in our facebook page, or in Instagram, Pinterest or Twitter. Preciosa composición de la tarjeta y el sello de los gatitos es precioso. Me gusta mucho. Martha, you never cease to amaze me! Your card is gorgeous and I absolutely LOVE IT!